The Internet enables 'virtual communities' to develop globally, linking people around the world who have shared interests. These virtual communities usually take the form of mailing lists, newsgroups and Web discussion forums. However, the Internet is also being used to enhance local communities - whether urban neighbourhoods or rural villages. This 'community networking' goes beyond online discussion and Web pages to include everything from public access and training to ecommerce and electronic democracy. Our main work in this field is available at Making the Net Work, and you will find items on the blog run by David Wilcox Designing for Civil Society. Here is an archive of earlier articles. Apologies if links don't work. What are the different types of online community? Communities of interest, locality and organisation. Where are there online communities? Links to online communities - both local and virtual, UK and global. Why consider creating an online community? What are the benefit for your neighbourhood, town or village? How did community networking start in the UK? Stories from some of the people who first found inspiration from US networks. Step by step guidelines, plus articles and links on the practicalities of getting your community online. 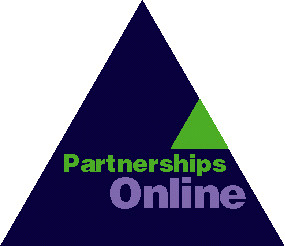 During May 1999 Partnerships Online ran workshops in Brighton at the Virtual Festival, and will be working with Sussex Community Internet Project to develop longer-term plans for supporting local projects. During autumn 1999 we worked with BBC Online to create a Webguide to local online communities and with BBC Webwise to help develop content and discussion forums about online communities. See also the pages on partnerships for process of collaboration and community involvement, and those on projects for examples of neighbourhoods online. The toolkit section will contain articles, techniques and links to other Internet resources providing help on creating communities online.